00:30:00 Makes 12 servings, 1 piece (26 g) each. Makes 12 servings, 1 piece (26 g) each. What's not to love about a bruschetta recipe that features bacon? Chopped tomatoes, parsley and Parmesan cheese meet up with crumbled bacon in this tasty bruschetta appetizer. Spread bread with cream cheese product; place on baking sheet. Bake 10 to 15 min. or until heated through. You will need 1/2 of a 400-g baguette to get the 12 bread slices needed to prepare recipe. 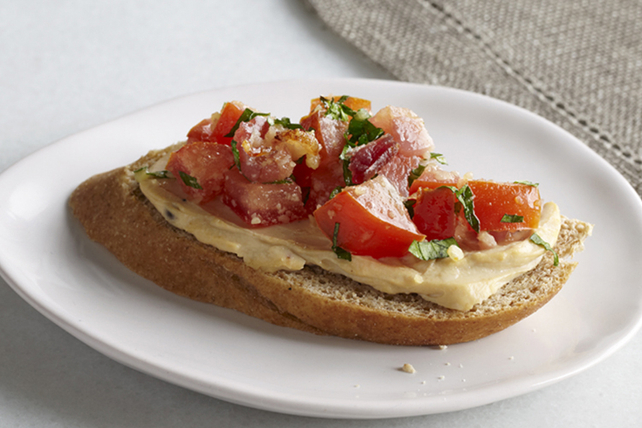 This bruschetta, made with better-for-you products, can be a delicious part of your healthful eating plan. Serving Size Makes 12 servings, 1 piece (26 g) each.